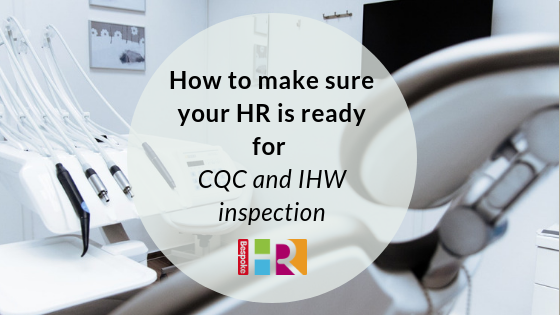 During a Care Quality Commission (CQC) or Health Inspectorate Wales inspection, your practice HR processes will be assessed. Failure to have adequate HR could lead to a failure of the audit, and serious consequences for the future of your business. What can you do to ensure your HR is up to scratch? Inspectors will be examining whether your staff are skilled, qualified and properly trained to fulfil their roles, and the onus is on you, as the business owner, to evidence this. Up to date job descriptions. Relevant contracts of employment / terms – including formal job offer letters for every member of staff. At least two references for every member of staff. Employee handbook containing sickness and absence policies, employee rights and procedures for disciplinaries or grievances. For healthcare staff check confirmation of Hepatitis B status. It’s also always a good idea to check the points raised from any previous audits as a starting point – addressing all the issues and then provide updates where needed. Inspectors are keen to see whether your staff are properly trained to allow them to do their jobs properly. Without a performance review or appraisal system it is hard to document this and ensure that staff are being developed. This can take many guises, read our blogs on how to conduct an appraisal, continuous performance reviews or implement appraisal software. A good induction plan for new starters also shows inspectors that your staff are properly equipped for the role. Read our guide on how to onboard your team. A robust training programme demonstrates that your staff are being developed, able to do their jobs and will not put patients at risk. Start your programme at the beginning of each year and align it with your appraisal programme to assess its success and identify areas where staff may need improvement or additional support. For larger practices it may be worth investing in an HR system, such as Breathe HR, to help you keep records of your employees, manage sickness and absence, time recording and holidays. Keeping all your information in one place will help inspectors recognise your commitment to HR. Inform staff about inspections, and what the inspectors are looking for so that you are working together as a team. Practice leaders need to understand requirements, so they can assist in ensuring that your business is compliant. For more information, or 15 mins of free advice, get in touch for an informal chat.